Raise your hand if you ever feel overwhelmed and confused about which sweeteners/sugars are the best to use in your treats? Uh-huh…me too. There are dozens of different sweeteners out there and all kinds of arguments trying to convince you to eat one over the other. While I’m certainly no sweetener expert (although I do consider myself an expert taste tester of all things sweet and sweeter), I will share with you what I’ve learned through the past few years of researching. This is by far my favorite sugar to bake with. It is processed in the traditional way that people of India have used for thousands of years and leaves most of the minerals intact. It substitutes one for one in recipes that call for sugar and has a delicious, rich flavor. Rapadura is a brand name for Sucanat, so in general I find that Sucanat costs a bit less. Be very careful to buy Organic Sucanat however, as some ‘regular sucanat’ brands I’ve seen are NOT dehydrated cane sugar juice…but some form of processed sugar with molasses added back in making it MUCH less nutritious. If you can find raw honey from a local bee keeper, go for it! Raw honey (honey that has not been heated over 117° to kill healthy bacteria) contains many nutrients and digestive enzymes. Raw honey is a wonderful addition to buttered toast or granola. Honey is also wonderful to bake with (although then of course, it won’t be raw anymore). If a recipe calls for one cup of sugar, I usually substitute 1/2-2/3 cup of honey. Mmm…I love maple syrup! I never bake with it, but find it works wonderfully in liquid recipes like Strawberry Milkshakes, Smoothies, Warm Vanilla Soother, Creamy Orange Cooler, etc. Oh, and it’s great on Pancakes and Waffles too! Because real maple syrup is kinda pricey, I am the designated syrup pourer on pancakes…otherwise we’d have a lot of this “Liquid Gold” wasted all over our pancake plates. Organic Grade B Maple Syrup is better than Grade A as more nutrients are present. Plus, non-organic maple syrups may contain formaldehyde or other synthetic defoamers. “Mom, can I please have some more formaldehyde on my pancake?” I don’t think so. Molasses is the “waste product” that comes from the production of refined sugar. It is rich in many minerals. I don’t use molasses much for baking, except in recipes such as Molasses Cookies. Mmm! This is by no means an exhaustive list of “healthy sugars”…these are simply my favorites and the sugars I’m most familiar with. Feel free to add your suggestions in the comments section if you have researched and know of a great sugar to try! This sugar is so refined that there are no nutrients left in it whatsoever. It is also usually bleached to make it prettier. Because it is not sugar in its whole form…it has a dramatic effect on blood sugar levels in the body. I can actually feel the effect white sugar has on my body (can you?!). While I used to believe that Agave Nectar was a healthy substitute for sugar, it seems I should have done my homework more thoroughly. Agave Nectar should usually be avoided as apparently, it is almost worse than High Fructose Corn Syrup. By the way, I think I’ve changed any recipes I have here on my site that included agave nectar as an ingredient…but in case you find it anywhere, please let me know so I can edit it! Ooh, I can’t say enough about fake sugar!!! Please don’t make the mistake of believing that you are eating/drinking healthier if you avoid sugar but use aspertame, splenda, or whatever the latest “fake sugar” is out there. They are worse than good ol’ refined sugar and can cause so many long term health problems. I have reasons to be passionate about this subject…so if you want to picture me down on the floor grabbing your feet begging you to avoid these…that truly is what I’m doing right now. You can read more information about aspertame here. I believe these testimonials may say more than I ever could. I’d love for you to share your experiences, thoughts on this subject, and favorite sugar choices with us! Thanks for setting the record straight! It drives me nuts when people think they are being healthy by substituting Splenda in everything. Just a tip – if there is a brew supply store near you, they may have a local raw honey source. It’s used in making mead. I’ve found that’s the cheapest way to get it where I live, the only “trick” is I have to remember to bring my own jar. AND to set the record straight… CORN SYRUP is WAY different than HFCS! Corny syrup is actually JUST glucose, NO FRUCTOSE, so your body doesn’t use the liver at all to break it down…. I have a question about gum. Does anyone know of a “minty” flavored gum that does not have artificial sweetener in it. One that has sugar in it. I have looked at Wal-Mart and couldn’t find any. I like that flavor for fresh breath. I do know the health food store has some with xylitol but that is so expensive. Just wondering if anyone knew of a regular brand that might have sugar. Thank you. I’ve ordered this xylitol one from Azure Standard before http://www.azurestandard.com/product.php?id=HB976 but you’re right, it is pricey. I don’t know of any other great ones out there…maybe other readers will have some good suggestions! I don’t like gum… but I am curious about mints, Laura. Any suggestions? OK, I had to laugh. I looked up mints thru Azure Standard. They do have mints. One of the ingredients? ORGANIC corn syrup! Oh brother. Too bad organic corn syrup is hardly any better than non organic. organic. What makes it organic? In all seriousness, am I better to get sugar free mints then? As long as they aren’t subbing fake sugar? Yeah, I think I’d lean toward buying mints with regular sugar if the only alternative is mints with fake sugar. I guess since you’re not just eating a whole pack at once, it isn’t too bad! in that it comes from corn that is not genetically modified; so that’s a good thing. I like Spry gum. I bought it at our local health food store in a 600 piece container. It was $45 (Yikes! ), but I’ve been using it over a year now (oh, it’s cheaper on Amazon). Xylitol is amazing for your teeth. It reverses tooth decay and keeps your mouth enviroment hostile to sugar feeding decay bacteria! If you consume xylitol while pregnant, you can pass on good teeth to your baby! Read the studies! I also use Xylitol toothpaste. Spry also has mints. I don’t like eating large quantities of the Xylitol as a sugar though, because large amounts at once can cause unpleasant digestive side effects like any sugar alcohol. However, chewing five or six pieces a day has never caused that problem. Spry also has mints. I have only had the lemon ones and they are good. While Dr. Mercola talks about how bad Agave Nectar is, I take what he says with a grain of salt. I read an article that refuted most of his comments about it (I wish I still had the link to share). As with any sweeteners, it should be used in moderation, but I wouldn’t say that it is as bad or even almost as bad as HFCS. I just read this article this week. She felt the same way you do. I think it is interesting to read the way it is processed and produced. I just want to give a shout out to Stevia, for those who are diabetic and cannot use even the good sweeteners. I know you can buy stevia leaves and use them to sweeten tea, etc. but I have never seen them used. I have tried the truvia and purevia and sugar in the raw’s “stevia in the raw”. They still have a little bit of an aftertaste to me, but the calorie-free sweetness comes from a real plant, not from adding chlorine to sugar! Have you used Stevia? I changed from Splenda to Stevia about a year ago. Yes, I’ve used stevia, mostly for smoothies. That’s about the only way I like it…it has a bit of a bitter aftertaste, but I LOVE how it doesn’t effect blood sugar! in my yogurt making process soon. rise! There’s a cookbook specifically for using Stevia. This is great information. Personally I am a huge fan of raw honey. It’s great because different varieties have different flavors. My all-time favorite is wildflower honey. I know a lot of people also like the orange blossom honey. I was sad to read about the turbinado not being that great. I have been using that for baking because it says it is evaporated cane juice. The sucanat is pretty expensive. I think I prefer to stick with my honey. BTW I started buying my maple syrup on Amazon with my Swagbucks. Grade B is cheaper too! I’ve been a fan of local raw honey for a number of years. Much better then sugar. With buying it local, it also has helped with my allergies. I purchase it in a 5 gallon pail and then break it down into quart size jars. I am trying to cut back on the bad sugars that we eat. One of the areas I struggle is with my coffee. Does anyone know which of these “good” sugars is best in coffee? I have used honey in coffee, and I really like it. Stevia’s great for coffee too! and there’s not sugar rush or crash from it. My parents use Stevia in their coffee. beautifully. Also, it has FOS for your gut bacteria. Thanks for this post! It’s nice to hear someone agree that artifical sweeteners are so bad. No one will ever convince me to trade in my real sweetener for some chemically altered substance! I’ve looked in my local grocery for sucanat and haven’t been able to find it. Do you have a source that you use? I buy organic sucanat from an Amish bulk foods store. It is about $1.25 for 3 cups. If you can find a good Amish bulk foods store that primarily services the Amish community and is not meant for tourists, you can probably find lots of good whole foods for a reasonable price. We don’t get Azure Standard where I live. I figure that paying more for it makes me want to cut down on sugar more so it will last longer! It’s still in your banana cake recipe.. the frosting. I acually bought some agave nectar about a month ago but haven’t used it and it’s still sealed.. I’ll be taking it back! I printed the banana cake recipe out this morning because I have BLACK bananas that need to be used. I was going to nix the frosting and make muffins.. ever tried that? I might sprinkle some sugar/cinnamon on top. I’m on the look our now for raw honey in our area! Ooh, thank you…I’ll go edit that now! I just started hearing things about Agave Nectar…I bought a bottle because I was told it was healthy for you! Thanks for the info! Stevia seems to be pretty good! I’m just not a big fan of the taste, so forgot to mention it! Hello thank you so much for posting such wonderful info, ideas , and recipes. They are a blessing to our family. We have been eating healthy four about 5 yrs , yet your recipes are new and fresh to us. I was living a raw vegan lifestyle for the last year ( due to illness) but was convicted add back in healthy meats and some cooked foods. This blog has really answered prayer and blessed or family. Wow.. I only know of ONE other Lael! well two, one is a recording company a friend just started, his daughter’s middle name is Lael. Thank you for posting your menus. It helps me a lot. Many of the recipes that I have are laden with condensed soups and velveeta. Toaster Oven- It is the way to go. You can reheat almost anything in it and don’t have to worry about the shape or crumbliness of what you are trying to heat- bread, waffles, pancakes, pizza, meatballs. I use mine as a mini oven quite often. Especially when we only need to reheat small servings. It makes avoiding the micowave much easier. The one recipe I need to update is the marshmallows. I’ve never tried honey marshmallows. Once I do that, I’ll replace the current agave. But I did add the agave warning link to let my readers know they should be cautious. My husband found one connection between agave and miscarriage on a site a while back – wow scary. I’ve had now two miscarriages but it was after we stopped agave – hopefully that wasn’t the cause. But I don’t dwell on that thought – God is sovereign. Thanks for your blog! You do have to store it in the fridge once it’s opened. I’ve never had any go bad, but I guess we eat it too quickly for me to know! Gah! Formaldehyde WHAT?? What on earth! Thank you for this list! We buy only organic sweeteners, but it’s nice to have even more info on them. Horror at formaldehyde aside, that is. Thanks for this list. I learned so much from it. This is a good list. I also use date honey as a substitute in baking. thanks for this post! i have been struggling with this topic! May I recommend two more “better” sweetners?!? Anyone have any thoughts about using fructose — fruit sugar, I know you can get it at some health food stores, but it looks quite processed (very white). Also heard to use frozen apple juice concentrate in place of sugar, but then again — processed (at least condensed). Looking for ways to keep the sugar low but still make “normal” things (like cookies and muffins) and stay on a tight budget. Unfortunately, fructose is highly processed and not a good alternative to sugar. Frozen apple juice is probably a little bit better, although since it is just the juice part of the apple, not all of the nutrients are left in. You need to make sure to get organic apple juice though because apples are one of the fruits on teh Dirty Dozen list. Thanks so much for the post. I was just getting ready to order a 33# bag of Rapunzel’s Rapadura from Azure. So, I went back to check the price and it actually works out to be less expensive than the Wholesome brand Sucanat from Azure. Rapunzel’s 33# bag works out to $1.67/# and Wholesome’s 25# bag comes to $1.80/#. Plus, I am splitting it with a friend. I thought Rapadura was like the equivalent of “white” sugar and Sucanat the equivalent of brown sugar. Interesting to find they are the same. Thanks again!! What do you know about Mexican sugar? I noticed that my Walmart (in Memphis) has sugar from Mexico that lists its ingredients as just “dehydrated sugar cane juice”. It is kind of grey in color and about $2.25 for 4 pounds. It is not organic, but maybe less processed than American brands? I know that sugar prices are not kept artificially high in Mexico as they are in the US – as a result most Mexican soft drinks (“cokes” here in Memphis!) are made with actual sugar, rather than less-expensive HFCS. In fact, government meddling in the form of price controls, thanks to our sugar-producers’ lobby, is the reason that HFCS is so ubiquitous in processed foods today. Just a couple of weeks ago, I noticed that my Costco (yes, my own personal one) is now carrying Mexican cokes – the real “Coke” ones! They taste GOOD! Unfortunately, my kids understood them to be some kind of health food and snarfed them in no time, so I won’t be buying them again soon. Ooh, don’t know. It sounds like the Mexican sugar must be similar to sucanat. Awesome. Hi Laura. thank you for this post. What are your thoughts or what do you know about demerara? I’ve found it at a bulk food store that I buy food at and have substituted it for white sugar. It is more granular but good but I don’t know about it’s nutritional value compared to sugar. Thanks! I’m not very familiar with demerara, but I think I’ve seen it at Walmart. I just read about how it is made (http://en.wikipedia.org/wiki/Demerara_(sugar)) and it sounds like although it is better than white sugar, many of the nutrients are stripped away. Still…it is better than white sugar! We enjoy using: Honey, Stevia (pure, not the mixed ick stuff you’ll see in shops these days, blah! ), honey, coconut sugar, bran syrup, molasses, pureed dates, and occasionally agave. ;) We also use a combo of some of them for our recipes. I just read this article this week. I think it is interesting to read the way it is processed and produced. I don’t know if anyone else has mentioned this yet or not (didn’t read all comments) but if you buy Canadian maple syrup there is no formaldehyde. It’s illegal to use here. http://www.lbmapletreat.com/faq/m_faq.htm scroll down to the very bottom to read about this. I’m Canadian and for that reason I don’t buy organic maple syrup, save a few $$! We can go this time of year to the sugar farms and see how it’s made, still a very natural process involving buckets hung on trees, collecting the sap and boiling it down in huge vats. LOL on the “designated maple syrup pourer” because I do the SAME thing! I look like a miser or something at the table but I know my kids would seriously over-pour the maple syrup too. Thanks for posting about the agave nectar because I had no idea. 3 years ago my midwife was telling me it was the best one to use. I always suspected that agave nectar wasn’t a very ecologically sustainable choice anyway, asI always think about whether or not something could be mass produced in a responsible manner. Is Succant about an equal amount replacement as sugar? For example, if a recipe calls for 1 cup of sugar is it a cup of succant? Thanks so much for this information; it was very helpful! Our family is on a journey to healthier eating! I use sugar and molasses most of the time. I am fortunate to live in one of the biggest syrup producing states, and while $44 a gallon isn’t cheap for syrup, it is cheaper than many other places. And like I told my sister – fake syrup is bad for you all the way around, at least the real thing has some nutritional value to it. I always wondered about the other sugars, thanks for clarifying. This is the first I’ve heard about agave nectar! Thanks for the info, I’ll be reading up on it. What do you know about the big soy controversy? Do you use soy? I avoid soy…that’s a subject on my “list” to blog about…eventually!! Laura, Would you mind sharing the url to the kind of sucanat you use from Azure Standard? thanks! Did you read about Stevia? I am starting to believe in conspiracy theories. Some stuff is just weird. I am encouraged that places like Japan have been usuing Stevia for years without problems. I am trying to get more ino the habit of using it when I want a bit of something sweet here and there. I love that it doesn’t raise your blood sugar, which I think is a good way to keep the sugar cravings at bay. My mother has been using it for a while. She recently decided that NuNaturals pure liquid Clear Stevia (from Fred Meyers) is some of the best with almost zero after taste. I almost can’t tell the difference between it and sugar in a beverage. I also think that Xylitol is pretty cool for how it can benefit your teeth. I think it should be used in moderation, though. I don’t like sugar alcohols. I too have stopped using agave. I have been using organic brown rice syrup as a sweetener. I haven’t done a lot of research on it, but it is a lower glycemic sweetener and works quite well in baked goods. I just bought this sucanat at http://www.azurestandard.com/product.php?id=SW046 it says organic in the details but not in the product name. Is it still as good? I sure hope so, but now I’m worried! Anyone who can give me some feedback would be great. It says it’s from wholesome sweeteners so I figured it was still as good. Please help! Thanks so much. I’m unsure about this variety. The ingredients say: Sugar, molasses…like they maybe add more molasses back in after they process it. But, the rest of the discription sounds like it’s good. SO, I don’t know. You’ll probably be fine. Regardless, it’s gonna be WAY better than processed white sugar! I called Azure standard and they let me take it back! do you use? Thanks again!! Thank you so much for this post! I just picked up “Nourishing Traditions” from the library and was dismayed to read that she equates “sucanat” with white sugar, but recommends Rapadura…! I was so confused and disappointed because I have a 25 lb bag of sucanat from Azure Standard! Glad to hear that she probably means the fake sucanat you discussed. I can now go safely back to using up my 25 lbs! I was also unsure about the difference between Grade A and B syrups (also just learned about the formaldehyde in non-organic syrup from the book). Definitely going to get the Grade B ORGANIC from now on! I can’t remember if I read a comment on this.. sorry if there was. I was at the store today, and I was looking at the sugars. Domino (a brand of refined white sugar) has what’s called pure cane sugar (I *think* it says organic). And it’s not white… is that like sucanut? And then there was always something called raw sugar (also not white). Ingredients listed turbinado sugar. The Domino pure cane sugar is just a tiny step better than refined sugar, not much better but okay to use in a pinch! So no, that’s not sucanat. Wish it was. The raw sugar is also not that great…again better though than refined sugar. Sigh…. I was hoping, since it wasn’t white. And it said pure cane so it had me thinking! I just started making my own homemade yogurt and it is so good. As I was looking for ideas on how to sweeten it for my little one, I checked out your homemade yogurt recipe and above the recipe you suggest sweetening it with agave nectar. Anyways, my little one is so used to the Yobaby yogurt that she doesn’t like the taste of my yogurt. I have tried mixing in homemade strawberry jam with fresh strawberries (which is so yummy), applesauce and vanilla, but she still does not like it. Do you have any suggestions on what else I could try? Thanks, I edited the agave out of my yogurt post! As far as breaking your daughter from YoBaby yogurt and getting her to like the homemade which is less sweet…I’d say keep her away from YoBaby and wait quite a while before introducing your homemade to her, so she kind of forgets about the other! Also, try making the yogurt into a smoothie with lots of fruit and a little real grade b maple syrup. It’ll be a different way to serve the yogurt and if she’s drinking it, she may like it better! one that works for each of us! Timely info! I just purchased some sucanat, but couldn’t remember if I should use it in the same amount as sugar called for–and hadn’t had time to come browse your site for more info! Perfect! **Also, I tried your Popcorn Chicken recipe a couple weeks ago, and my kids loved it and requested it be added to our meal rotation. Thanks for sharing! Do you know anything about date syrup? I just picked up a jar today, thought it might be nice in my date bread in place of the refined white sugar. No, I’m sorry…I’ve never researched it much. I should put that on my list! I love sucanat, raw honey and real maple syrup! We still use organic cane sugar for somethings but I feel if it keeps us from eating packaged crap it’s okay. Brown sugar is not too much better than white sugar…it’s highly processed. BUT given a choice, I use it over white sugar since it is unbleached. “raw” brown sugar. Just curious. Yes, I do just replace brown with white. Turbinado sugar is better than brown sugar, but not as unprocessed as sucanat. Forgive me if this has already been discussed earlier… What is ‘demerera’ sugar? And is it one of the better ones or one to avoid? I had a coupon and bought some last week, but wondered if it’s any better than regular brown sugar or white sugar. This is one of the ‘better’ sweeteners I can find since I don’t have a health food store nearby. Demerara is quite processed, unfortunately. My understanding of it is that it has been processed much like white sugar, then molasses is added back in to make it look healthier. It IS better than white sugar if that is your only option, but there’s not many nutrients left. Thanks Laura! I kinda had a feeling that was the case. In my small town there’s not many choices for healthy sweeteners. Guess I’ll be ordering some online! I have a friend who asked me what I thought about Sugar In The Raw brand. I buy Rapadura from Azure and I don’t know anything about the brand she mentioned. It is like Sucanat? Thanks. No, Sugar in the Raw in quite a bit more processed than rapadura or sucanat. Actually rapadura is a brand name for sucanat, so essentially rapadura and sucanat are the same thing. Hey I know you wrote about this forever ago, but I wanted to tell you about Steviva. It is a stevia based company and I have been using it in a lot of my recipes. I am actually going to do a blog post about it tomorrow on my blog thethingsilovemost.blogspot.com so come by and check it out!! Thanks for your great post. I think it is all so confusing and moderation is the key, and also know what your body can handle! I personally prefer raw local honey and pure organic grade b maple syrup. My husband loves Stevia for drinks (I can’t stand the after taste). We use turbinado right now because it was cheaper than the sucanat. But now that I know the difference between the two, when my storage runs out we’ll be replacing with sucanat. Quick question about honey. I have not found a source for raw honey. We do have locally grown, but it is not raw, and it is very expensive. Is honey purchased from the grocery store still a better choice than white sugar? I have also had some luck with sucanat, which I have found a local grocer. Thanks! Yes, honey from the store is still better than white sugar…if that’s your only option, I’d go for it until you find something better! I also have a question about honey. I recently purchased my first raw honey and it is much creamier and more solid (I can’t just pour it out) than the honey I used to buy. Your picture of honey at the top of this post looks more like the honey I used to buy and I am wondering if that is raw and where you purchased it. Thanks! 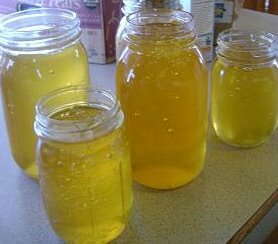 I’ve bought raw honey from different sources, and sometimes it’s runny (like what’s pictured) and sometimes it’s more like a spread. I don’t really know why some honey is like that…aside from the fact that it has crystalized a little bit. Very interesting! This explains some of why the honey looks different. You can heat honey to clarify it if you have crystallization. This is awful bossy of me but can you do some research on coconut sugar and let me know your thoughts. I ordered some with my Azure Standard order last week and have been enjoying it in my coffee. It also made fantastic waffles. Thanks! I’ve got this on my “list” (others have asked the same), but no promises on when this research will be done and posted about!! It sounds really yummy! I didn’t find much about coconut sugar, at least from any sources I know I can count on to give me accurate information. From the description on the Azure site, it seems to be pretty good. One source I found said, “The coconut palm sugar found in Thai markets generally are not 100% pure coconut palm sugar, but is blended with white cane sugar and also malt sugar” – so you’ll want to be sure what you find is PURE and not mixed with white sugar or malt sugar. written article on the subject onthe Tropical Traditions website. (They no longer sell coconut sugar). I have used coconut sugar for a while now. It works far better for my husband’s diabetes. He can have desserts, if I use it, but even using sucanat, he has to watch out how much he eats. It may be the same with coconut sugar, he has finally learned not to eat a king’s portion each time he has something. I don’t like the idea that the coconut sugar is non sustainable. And it was unavailable for a month or so when we got the first 5 pound bag to test the waters on it. It will only raise my husband’s blood sugars about 20 points not the 150 as with sucanat, or 200 with sugar products. Thanks for doing this blog! I do appreciate all the effort you put into it and all the great info you help us gain! What are your thoughts on honey granules? I haven’t researched them, so I’m not sure. If they are ONLY made of honey and nothing else, I can’t imagine why they’d be bad for you. I know someone who highly recommends granulated fructose as a sweetener alternative over anything else because it is has a low glycemic index. Any thoughts on that? Unfortunately, I have to disagree that granulated fructose is a better option than regular sugar. Fruit sugar is just about as “bad” as regular white sugar as far as how it effects our body and insuline levels. I used to use it a lot, and it bakes very nicely…so I wish I could recommend it…but I really stick with Sucanat now for baking. Laura I totally agree with you! Fructose raises my husband’s blood sugar just as much as regular sugar. They used to say it was safe for diabetics, but now they know it is no better than regular sugar is. Fructose is not low on the glycemic index. There are several things that need to be taken in consideration about how sugars react on the body. Fructose will raise the blood sugar and sustain it over a long period of time. It used to be the train of thought that because fructose was in fruit, it was safe. However, in the freshly picked fruit, it IS safe. Granulated fructose, just like white sugar has been processed and it is that processing that will create issues. Tell me your thoughts on Stevia?? Stevia is a healthy sweetener as far as I have understood. I just don’t prefer it…I find it bitter, unfortunately. no matter how little you use. i’ve heard that using too much stevia can actually be toxic–i dont’ remember where i read that, but it was the number one reason i was against using it. i did end up trying it and had a reaction to it anyway, so it’s out for me! but do a little more research on the toxicity? I heard 30 years ago that the FDA tried to not let it in, but that was because the sugar alternative companies didnt want it here.. now its being used all over the place. It has been proven that it is not toxic – and the diabetic council has approved it as a sugar substitute. Thank you for this info, Sue! I will give it another try. I’ll bet we used way too much as well. I know it is said to be good tasting as well as good for us. I thought the same of the taste of stevia. However, a few grains of salt offset the bitterness. Now if you have an aversion to salt, this wouldn’t work for you but for a diabetic, it may do the trick! I wanted to add another Stevia Comment. I started substituting stevia for some sugar in my baking. I typically have cut the sugar in half for many years, but now I cut it to 1/4 sugar of the sugar in the recipe and you can use 1/4 t stevia for the rest. The substitution amount is 1t stevia = 1 cup of sugar. I have also started using coconut nectar in some recipes as well as raw organic sugar and sucanat. I made cranberry orange relish for the holidays and used the sugar substitution with raw sugar and stevia. My kids cant ever taste the difference when I do this!! One teaspoon = 1 cup of white sugar?? I’m new to trying alternatives for my family, but this sounds like such a little bit. I use one packet of Truvia to sweeten my tea. Could you confirm? I used to be all for agave nectar too… have since done my homework as well. gross. how good is crystallized cane juice. A little better than “regular white sugar”…but not as nutritious as Sucanat or Rapadura (dehydrated cane juice). what about “evaporated” cane juice? Goofy all of the names for products. crystals – are you familiar with any of those? Evaporated cane juice seems to be another name for “organic sugar crystals” from what I’ve noticed about them. They are quite different from sucanat, which is DEHYDRATED sugar cane (so confusing!). Evaporated cane juice does not retain as many nutrients as dehydrated. I’ve not researched the coconut sugars. Interesting! recently purchased the sucanat so now I can replace the other sugar. I am shocked about the agave thing…crazy…what about raw agave??? is there a difference?? Maybe a little bit. :( Frustrating, huh? Do you know how to substitute sucanat for agave. I have found a recipe that I want to try but it calls for agave and I am not sure what the right measurements might be. Thanks! I’d probably try just subbing it one for one to see how that works. Hard for me to tell you exactly without looking at the recipe, so hopefully I’m not telling you wrong on this one! The use of formaldehyde in maple syrup production has been illegal for years. Also, most producers do not use chemical defoamers, but use butter or other oil as a “defoamer” to prevent boiling over. We live in Southern Ontario where maple syrup is produced (we are actually going on a sugar bush tour with our kids tomorrow!) and I cannot justify paying twice as much for certified organic syrup when I know our local product is just as purely natural. That’s awesome for Canada. However, the US still loves to use chemicals so long after other countries outlaw them. Do you use sucanat for everything in place of white and brown sugar? What if a recipe calls for white and brown sugar, would you use sucanat for both measurements? I’m guessing evaporated and dehydrated are not the same thing. it answers my question. Except for the both measurements part. If you can get your hands on Honey Granules (brand, not product), i keep hearing that it is the best substitute for white sugar, from the perspective of color and flavor, without compromising nutritional value. Unfortunately, the only place i know of to find them is the Bread Beckers, out of Woodstock, GA. I order from a local co-op and they had this great explanation some popular sugars. You can take a look here: http://www.bulknaturalfoods.com/rapadura-organic-whole-cane-sugar.html. Now I’m confused. The information on the link above says that Sucanant is NOT the same as Rapadura. Help!!! My guess is that the information in that link is older (outdated) information. Sucanat used to be processed differently than rapadura, making rapadura a healthier choice. Now, sucanat is being processed just like rapadura – deyhdrated cane sugar juice. SO, basically they are the same thing – Rapadura is a name brand version of sucanat. Hope that helps and isn’t MORE confusing! About raw honey: do NOT trust the raw honey you buy in grocery stores! The big yellow can you buy in stores like Safeway? In all likelihood it comes from China (even if other countries are listed; China got wise and started shipping through other countries to hide the real source)and in many cases they adulterate the honey with high fructose corn syrup. Make sure you know the people you buy your honey from. Buy local! It’s healthier than regular white sugar, but still a little more processed then sucanat. So…I use raw sugar or turbinado guilt free every once in a while, knowing that at least it’s better than regular sugar, but if at all possible, I use sucanat (or maple syrup). how do you store 50lbs of sucanat? I store it in big tupperware type containers. So pretty much the only thing my hubby will drink is kool-aid. I have been looking for a way to make it without white sugar (even though he brought me home two bags of white sugar from sam’s the other day!) Would Sucanat work for that? Thanks! It might work – I think it would make the kool-aid flavors kind of funky though. Maybe try using organic EVAPORATED cane sugar, which is at least better than white sugar, but tastes pretty much like white sugar as the molasses has been removed. Bread Beckers recommends substituting honey granules 1:1 for white sugar and sucanat for brown sugar in recipes. Thought I’d share! Ok, so amongst all of the various confusing options what do you think about muscovado, Lo han, and pure glucose? Muscovado I feel good about – glucose I haven’t studied up on. Anyone know anything about xylitol? You’ve most likely seen it in trident gum. I went to see an herbalist and her recommended it because it doesn’t affect your blood sugar. Laura, how do you research these things, where do you look? Laura, I have heard good and bad about Dr. Mercola, so I was surprised to hear that you trust him. Ccan you share with me what other sources you consult to base your decisions on? I LOVE all of the recipes you share and all of the information too…thanks for ALL you do to help all of our families get and stay healthy. I have read as well is seems to be a good option. Hi, I know this was written a year ago but in recent study’s and on the news brown rice syrup has arsenic that can cause cancerous tumors. D: Yikes! Now tell me that isnt scary. The reason being is because most of the brown rice syrup comes from China and in China there are no pesticide regulations. I would like to offer a suggestion for less syrup waste form those boys. :) We use little dessert cups for dipping our bites of pancakes/waffles/etc. into instead of pouring it on. I think it allows us to ration it out better. Each person is allowed their portion and if they use it all up on their first two pancakes and don’t have any left for their fifteenth :) then that is their decision. It helps to teach moderation and self-control. For really small children there are tiny little cups that hold up to 2 TBS of fluids (we also use these for training babes to drink from a real cup with no “sippy-lid”). But for older ones who will eat more and don’t want to continually refill their tiny cups (not to mention their “bite-sized” pieces are generally too big to fit into the tiny cups anyway) we use the desert cups. I believe they are one-cup serving size. You can use your own judgement for how full they need to be. :) HTH someone with the syrup-covered-plate-after-pancakes problem. Cheers. Enjoyed reading your post on sweeteners. What type of sweetener would you recommened for someone who is Diabetic? I was told that Agave Nector was good, but after reading your post, I’m not sure. What do you think about sorghum? I have been trying to find a good replacement for the corn syrup in pecan pie. Thanks! I think that should be okay. I haven’t researched sorghum much to know details about it. What about Evaporated cane sugar juice? I found some at Costco and didn’t know if it was the same as Dehydrated cane sugar juice. Tricky question! :) Most of the evaporated cane sugar juice I’ve seen is different from dehydrated cane sugar juice. Evap is usually white(ish) in color and looks sort of like raw, organic sugar. DEHYDRATED cane sugar is usually a little more course and brown in color – it is better for you. BUT, Rapunzel carries a brand of Evaporated cane sugar juice that LOOKS and acts like Dehydrated…and this one I feel is okay to use. I have not tried sucanat but I buy organic sugar, raw honey, Truvia (your thought on that? )and I have tried xylitol, etc. but we use stevia for sweetening our beverages. I agree there is a nasty taste with most stevia but we use NOW brand stevia glycerite, and I am careful not to use too much. I buy mine online through iherb.com and they discount every order and over a certain purchase amount, shipping is free. You can use a code (TIQ463) for $5 off your first order. I have ordered supplements and stevia from them for years. About the sucanat for powdered sugar, would it need some organic cornstarch added and if so, how much? Thanks for everything you do and for sharing your knowledge with us! Oh, and Stevia has zero calories and comes from a plant. It is natural is not toxic, unlike the other no calorie sugar alternatives. What about demara sugar? Have you ever used it? Interesting about agave nectar – I bought my first bottle this weekend. hmmmmm! I haven’t used it, but it is my understanding that it has fewer nutrients than sucanat. I have just gone through chemotherapy, and have for most of my adult life, have eaten mostly correct. While talking to my oncologist about foods, she said sucanat is likely the product that will come out shining, while most of the other forms of a sugar substitutes will end up showing us as not as good. Sucanat is less processed than other sugar substitutes, and is more healthy than most others as well. Coconut Sugar is a new product to our section of the world, anyway, and there is little available out there to learn about it. I am wondering if you experimented with Honey Crystals at all? Or have any thoughts on it? I am trying to find information about Zulka. It is supposbly pure cain sugar sold at most wal-marts and on Amazon. Can anyone tell me if this is a good brand to buy? This is what I am asking about also. I forgot to include the brand name in my post. A long time ago I read that maple syrup was better for you so I started using it instead of syrup. Now I’ve learned that Grade A is better than B. I price checked it and I want to stick with A. Is there any health benefits to A though? I’m beginning to think I should use B or not use maple syrup. Your advice is appreciated. I meant B is better than A. 7 months ago at 52, I decided I had to get healthy or die. My 35 years as a professional Chef has helped me create delicious, healthy foods. I’ve lost 70 lbs., have muscles for the first time in 20 years, and am no longer “sick”. As far as natural sugars, the HEALTHIEST is DATE SUGAR. As you know, the more refined a sugar is, the faster it hits our bloodstream, making harder for the pancreas to keep up with insulin production to counter balance the sugar. Date sugar is made by drying whole dates then grinding them up. COMPLETELY unprocessed. All of the fiber and minerals remain. I was happy to see you post the article about Agave. So many people think it is “healthy” because it “sounds” healthy! I just found your website through a recipe search I did earlier today and I loved the writing style! I also liked that your approach to food is very similar to ours so I most certainly will come back more often for recipes. I was stunned about the agave nectar being bad for your part on your list and read the article. However, something in this article made me suspicious because the writing was somewhat dramatic and manipulative so I did some more searching. I did find several great articles that looked at Dr. Mercola’s claims and for those you gave up agave nectar purely based on this article, there may be hope. The links can be found in the top comments box of the HuffPost article. I don’t mean to start a big discussion but if the other sources may be worth a read. Our family LOVES sweet tea. We are from the south, and its pretty much a staple here. What do you suggest as an alternative to white sugar to sweeten it? Oh, by the way, its generally made by the pitcher full. Thanks for any input. I’ve been using Stevia for going on 20 years. It is from the stevia plant and is a healthy sugar choile Any health food store carries it as well as Trader Joes. Make sure you get the 100% stevia with no other fillers or ingredients. The TJ brand comes with a small spoon, just start with 1 spoon in a pitcher, and taste. Stevia is extremely concentrated so start small and add more as needed for your taste. You can You can try adding honey and find out if that meets your taste. Sometimes people think it has an after taste, so adding honey or some raw organic sugar – its brown in color( NOT brown sugar) I get mine at Costco. I only use regular table sugar when im at a restaurant in my tea or coffee. Never use the fake alternative sweeteners – even if you’re at a restaurant, they are toxic to your body. Thanks so much Sue. I am looking forward to trying out the Stevia. I hadn’t considered it before. We have some raw organic sugar and raw honey in the pantry too, so I’m going to do a little experimenting with those. Totally with you about the artificial sweeteners. They are horrible. We love using stevia to sweeten iced tea. I use about 3/4 teaspoon for 1 gallon. I’ve neve understood why people say it has a bitter aftetaste because we’ve never experienced that.I use the liquid and the powder. like them both. I also use stevia to make lemonade with real lemons. My four boys love it. That is also part of their “medicine” when they get sick. I squeeze half a lemon in a glass of water & SPRINKLE in some stevia. If one gets sick I like to give it to all the rest to keep them from getting sick. its a great immune booster. Like to drink some every morning as a maintanance. I completely agree. I have come to find out that people that say its bitter are using WAY too much stevia.. I tell them to only use a tiny bit and they all respond the same with a “Ahhhh” as if they agreed.. I just started baking with it. .I substitute 1/2 of the sugar in a recipe for stevia.. 1/2t equals 1cup of sugar, honey, etc.. I have recently found Moreno pure cane sugar for a reasonable price at the grocery store and what I’ve read on it sounded good but I don’t know how it compares to the sweeteners you have described. I have used sucanat before that a friend gave me and it is different from that. I was wondering what you might know about this product. Thanks. I’m so confused. I can’t find sucanat in my town. But I’ve found organic crystalized cane juice and organic evaporated cane sugar. I don’t live in the US so ordering online is not that easy (or inexpensive). I don’t understand the difference. Which is better? I currently use Coconut Sugar. My husband keeps his blood sugars under control if he uses it, and does not eat highly processed foods, such as white flour, canned and otherwise packaged foods. We use coconut sugar very sparingly. We don’t use much made with four as it also causes blood sugar spikes. I really like Coconut Sugar, it is similar to Sucanat, or other crystalized cane sugars. I can’t agree more on the person who said not to use artificial sweetners! YOu are much better off using white sugar, in my opinion, than you are using aspertame, splenda etc. Hi! I have had diabetes for 39 years and have tried nearly all sweeteners under the sun. I must say that by far, the healthiest (for my glucose/ sugar levels) is Agave Nectar. I am sorry to see you mentioned it being like Corn Syrup. I make bread weekly at our house and I usually use Agave nectar as my glucose sugar levels are steady rather than when I use maple or honey in my recipe. I hope you’ll consider looking at it again with this angle spun on your perspective. Agave is GREAT for diabetics, regardless if it’s “just like high fructose corn syrup”. I live with someone who…well, she will never change her eating habits so it’s white sugar and that is that. At one point I had to beg and plead that she purchase agave nectar on a doctor’s recommendation (for my diabetes, but I never really used much of it and now all I hear are bad things). This means sucanat is not likely to be found in this household. So, for your recipes, how much white sugar or brown sugar should I use to replace it? I’d go one-to-one, or use a little less sucanat than white/brown sugar. Hi! What do you think about raw sugar? Some friends of mine who are also trying to eat more whole foods recommended that I use that instead of sucanat. Do you have any thoughts? Thanks so much!! !